What does the basic validation do? Simply enter the URL of the document you want to validate. This document can be HTML or CSS one. This solution allows you to upload and check a local file. Click the "Browse..." button and select the file you want to check. The same comments as before apply. Note that this solution is very convenient if you have a problem and need some help from the community. It's also very useful to report a bug, since you can link to the resulting URL to give a test case. When using the basic interface, the validator will check the compliance against CSS 2.1, which is the current CSS technical recommendation. It will produce an XHTML output without any warning (you will only see errors). The medium is set to "all", which is the medium suitable for all devices (see http://www.w3.org/TR/CSS2/media.html for a complete description of media). If you need a more specific check, you can use the advanced interface which allows to specify three parameters. Here is a little help on each of these parameters. 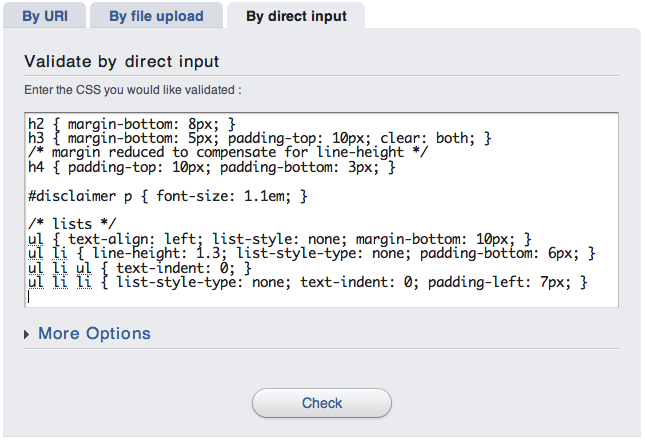 This parameter is useful to tune the verbosity of the CSS Validator. Indeed, The validator can give you two types of messages: errors and warnings. Errors are given when the checked CSS does not respect the CSS recommendation. Warnings are different from errors since they do not state a problem regarding the specification. They are here to warn (!) the CSS developper that some points might be dangerous and could lead to a strange behaviour on some user agents. A typical warning concerns font-family: if you do not provide a generic font, you will get a warning saying that you should add one at the end of the rule, otherwise a user agent that doesn't know any of the other fonts will switch to it's default one, which may result in strange display. The CSS validator can check different CSS profiles. A profile lists all the features that an implementation on a particular platform is expected to implement. This definition is taken from the CSS site . The default choice corresponds to the current most used one: CSS 2. The medium parameter is the equivalent of the @media rule, applying to all the document. You will find more information about media at http://www.w3.org/TR/CSS2/media.html . Below is a table of the parameters you can use to send a query to the W3C CSS Validator. replace with the address of your own server if you want to call a private instance of the validator. Note: If you wish to call the validator programmatically for a batch of documents, please make sure that your script will sleep for at least 1 second between requests. The CSS Validation service is a free, public service for all, your respect is appreciated. thanks. The URL of the document to validate. CSS and HTML documents are allowed. None, but either this parameter, or text must be given. The document to validate, only CSS is allowed. None, but either this parameter, or uri must be given. The language used for the response, currently, en, fr, it, ko, ja, es, zh-cn, nl, de, it, pl. English (en). For more technical help, in particular about the SOAP 1.2 output and all the possible ways to call the validator, see the CSS Validator Web Service API.